This year I was determined to hand-make all the ornaments for our Christmas tree. Since we’ve moved to Ecuador, I’ve rediscovered my love of crafting. While life here can be crazy busy, it can also be the complete opposite, so during those “down” times, I make things. And for the month of December those things will be Christmas tree ornaments. I’m pretty sure that the tree will be filled by the time Christmas eve rolls around. However, my love for a “vintage” and “crafty” tree is not shared by all in the household. Upon sharing my crafty plan with Sassyfras, she promptly asked, “So you mean we’re not going to have any colorful, shiny, Christmas balls on the tree?” Uh, yeah, that was the plan. It’s always funny to me what people latch on to as their favorite things at Christmas. I have an affinity for those old fashioned Christmas bulbs and the whole retro look. Sassyfras on the other hand wants to be sure that the gaudy Christmas globes don’t get left out. Needless to say, I went out and purchased a small box of polka-dotted Christmas ornaments (of the sphere variety) and added them to the tree. Now my plan is that MOST of the tree is covered in handmade ornaments. I put my plan into action about two weeks ago and scoured Pinterest for the best ornament ideas. 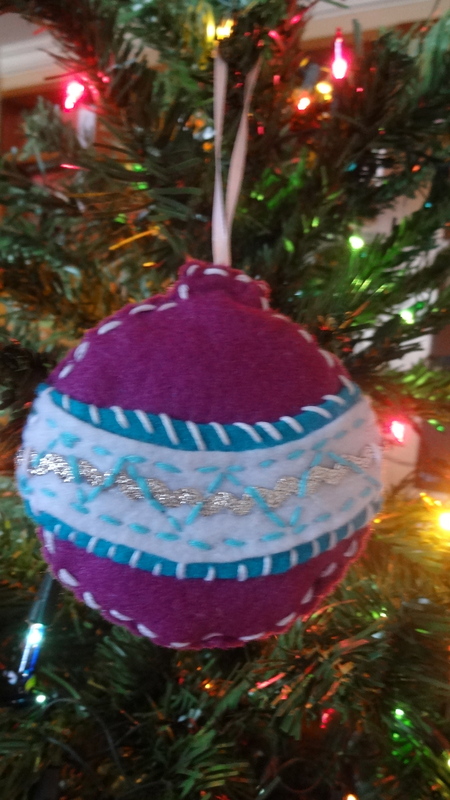 Since my materials are fairly limited here in Ecuador, I was drawn to every manner of felt ornament: felt, glitter, glue, and thread I could do. But if you know me at all, each ornament had to have some sort of meaning; therefore, I began looking for ornaments that reflected our home’s occupants and or interests. It’s a Pickle! 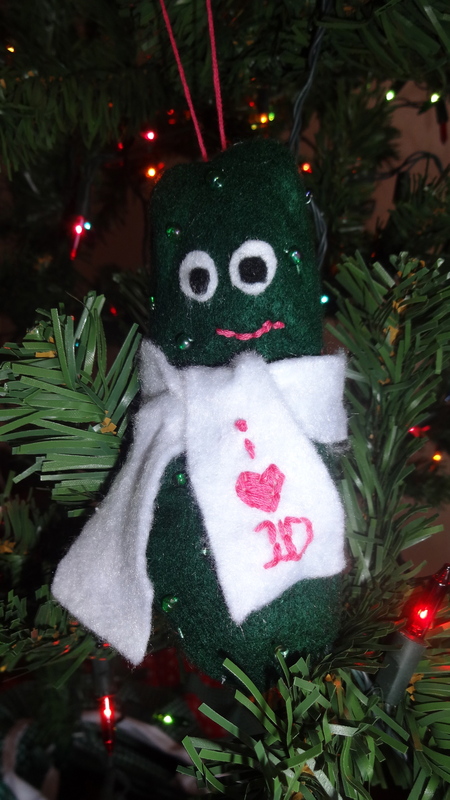 Besides the fact that Sassyfras loves pickles, she also loves the band One Direction, so I made it a 1D fan pickle. Needless to say, she LOVED it! For Caden, I left the felt and went for a “cooler” ornament. 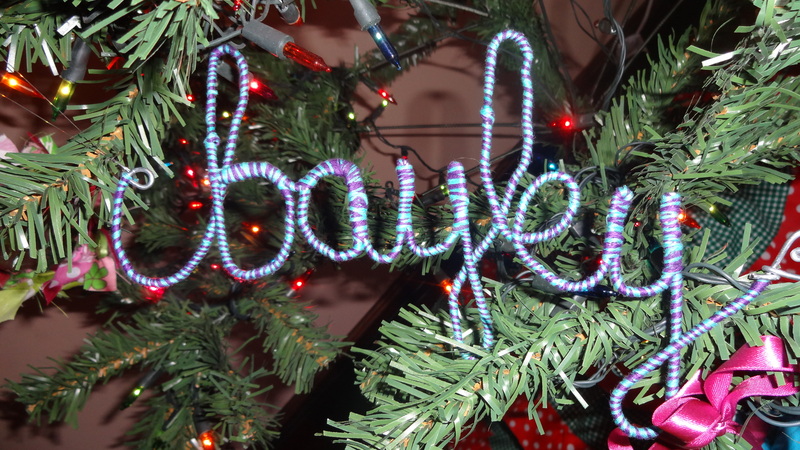 I found these great name ornaments made out of jewelry wire and cross-stitch thread. Of course, I made it in colors of his favorite state and team: Tennessee. I liked Cade’s ornament so much that I made one for everybody. If you know Keith you know that he absolutely loves this ornament even if he did mistake it for another “thing” before I had to explain to him what it was. Last week, I wrote about my experience with the Ecuadorian driver’s pre-test. When I first showed this ornament to Keith, he died laughing and thought it was hysterical. It looked just like the two roads and circle test that we had to take. Unfortunately, I was going for a piece of bacon, Keith’s favorite food. Oh well, now we have ornament that is doubly meaningful. 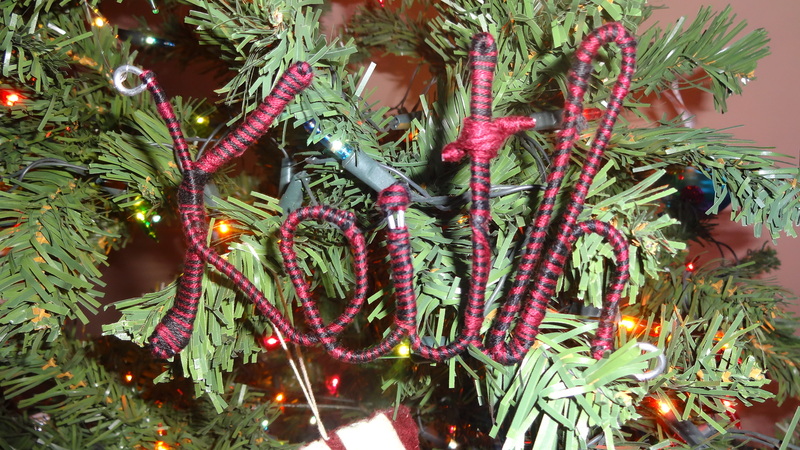 I continue on my quest for a mostly handmade ornament tree with it’s vintage and personalized feel. I just hope that my crafting skills don’t cause other ornaments to be mistakenly incognito. 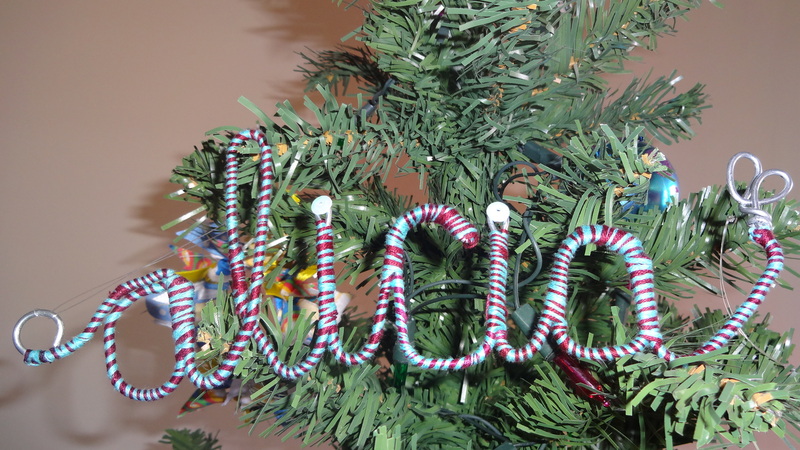 This entry was posted in Christmas, crafts, Holidays, Missions on December 4, 2012 by aliciachall28. I guess God gave you and Terry all of the crafting abilities in the family. Love and miss ya’ll.